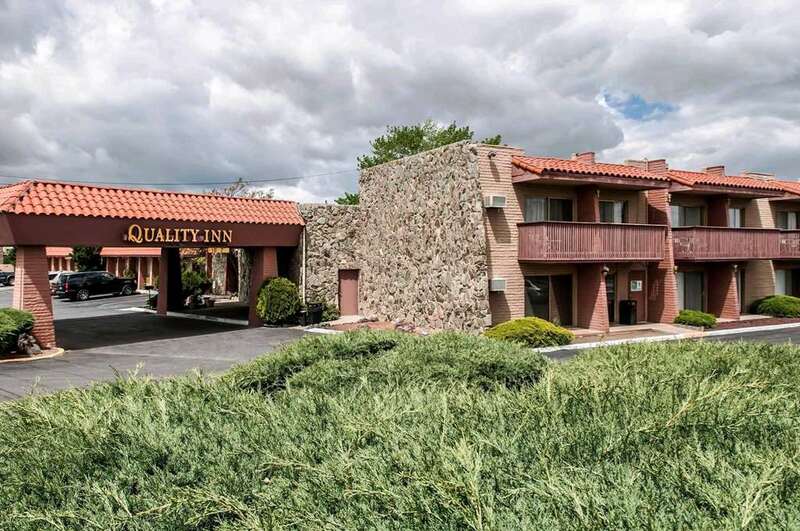 Nestled in the scenic foothills of the Sangre de Cristo mountain range, the Quality Inn hotel in Santa Fe, NM is just 10 minutes from historic downtown and the Santa Fe Municipal Airport. Here, we help you get more for your money, whether you are on the road for work or leisure, with our daily free hot breakfast, free WiFi, an exercise room, outdoor heated pool and business center. Embrace the Santa Fe style and all that the northern Rio Grande Valley has to offer while also enjoying your spacious guest room. Each room features a TV, refrigerator, coffee maker, hair dryer, iron and ironing board. Also, earn rewards including free nights and gift cards with our Choice Privileges Rewards program. Pet Accommodation: 10.00 per night per pet.Pet limit: 2 pets per room, up to 25 lbs. 860 sq. ft. space meeting or banquet room. 24 hour coffee in the lobby.